There is a great song by Tom Petty which I always find moving. 'Southern Accent' conveys the longing to be back home with kith and kin when you are living away - summed up by 'there's a southern accent, where I come from'. Having grown up on a sheep farm in South Otago (just out of Balclutha and only a few kms from Telford) I can certainly claim that there is a southern accent where I come from. I still have plenty of kin down there and when I take the family down to Kaka Point for Christmas holidays the 'rolling r' is very much in evidence. Often the students that I teach also have the accent and I can usually even tell if they are from South Otago or Eastern Southland (although I couldn't explain the difference). Having lived away from Clutha for 28 years, first in Dunedin and then Canterbury, I have almost lost my 'rolling r' (although, interestingly, my sons developed the accent for a while when they learned to talk). Sometimes it pops out though. It doesn't help that my parents moved to a farm just out of Ashburrrton, which I end up saying a lot. So this accent is a little clue to my past. It tells a listener that I am likely from the southern part of New Zealand. Why does the accent exist? It's not like it is the result of genetic mutation and yet it is passed from one generation to the next. If a child is born in Balclutha or Gore or points in between then the predominant accent they hear is that of locals and so the accent is passed from one generation to the next. No genes required, just a similar environment for each generation. There is speculation that the accent is a remnant from the predominantly Scottish settlers in the region. So behaviour can tell us something about the past. How far back can it provide information for? In biology we are often interested in how species and their traits have evolved. We use all sorts of information to help reconstruct what ancestors were like, where they lived and what they did. Genes and morphology (what traits look like) are commonly used but what about behaviour? Can behaviour tell us about what happened in the evolutionary past (hundreds to thousands of generations ago)? There are some obvious arguments against using behaviour like this: instability (behaviours can change from use to use), evanescence (behaviour only last a short time and are gone), lack of trait independence (behaviours don't really have clear beginnings or endings but rather merge into one another), small likelihood of fossilization (so no way to actually know for sure what ancestors did) and problems with homology (how do we know that a behaviour that we see in one species is really the same as one that we see in another species). All good questions that have been asked since Darwin wrote the first book on animal behaviour. Over the last couple of decades various researchers have looked at what behaviour can tell us about evolution of species, usually with positive results (for example as part of my PhD I looked at this question in New Zealand seabirds, like albatrosses and shearwaters). In recent years I have asked similar questions about penguins. Penguins are a great charismatic bunch of birds, a widely distributed group of species spread around the Southern Hemisphere. As Joe Bennett said this week (in The Press) "Penguins are barely birds. Their feathers are like fur and their wings are flippers. They swim like seals, they walk like drunks and the fly like bricks". While we know which bird species clearly belong to the penguins, the relationships among the penguin species and how they are related to other bird groups is much less clear. This is likely because penguins are so adapted to the marine environment that it has removed many morphological clues. Perhaps behaviour will fare better and provide information about penguin history? My colleagues Russell Gray (University of Auckland), Graham Wallis, Martyn Kennedy (University of Otago) and I set about finding out. In research published in Cladistics we were able to show that it's a complex answer. We worked under the principle that similar behaviours in some species implied that they were closely related (the behaviour had evolved in a common ancestor and been passed on). First, we started by collecting information on behaviours, such as courtship and aggressive displays, and life history traits, such as types of nests and timing of breeding. 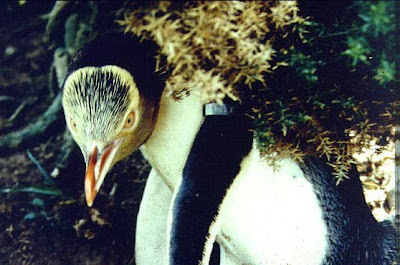 The main difference between these types of traits was that behaviours were clear actions performed by the penguins whereas life history traits were the outcomes of behaviour decisions, e.g. living in forest is not a behaviour but it is the consequence of behavioural decision making by individual penguins. We collected 68 traits that we could compare between penguin species. We then took this data and constructed an evolutionary tree for the penguins. A good reasonably sensible tree was made from the data but how could we tell if it was the 'correct' tree? For penguins there has been extensive DNA analyses of their evolutionary relationships over the last few years and we are reasonably confident that we have the 'correct' penguin tree based on DNA. So it was a matter of comparing our behavioural tree with the molecular tree. Surprisingly, the trees did not match significantly. Why is this surprising? Well, most other studies like this have found that behaviour trees are just as accurate as molecular trees. So what was up with penguin behaviour? Were penguin behaviours more changeable than other types of animals? Mapping behavioural traits onto the DNA trees indicated that many of the traits had persisted for millions to tens of millions of years. What seemed to have happened though, was that some behaviours in different species were similar to one another, not because they had inherited the behaviour from a common ancestor, but because they had converged to be similar looking behaviours with similar functions (they looked the same and did the same things). Perhaps this is because the selection pressure of living in a marine environment constrains the kinds of behaviours that will work there or perhaps the morphological changes of penguins adapting to water constrain the types of behaviour that these body shapes can perform. So, while some penguin behaviours tell us about the distant past others tell us about the compromises that penguins have made to living in an environment reasonably foreign to most other birds. This is a little analogous to my southern accent. The 'rolling r' of southern NZ tells us that ancestors of the current population came from Scotland (which mine did). However, some of my friends at school had parents that had emigrated from the Netherlands after the war. They still had the southern accent but that was an adaptation to living in the southern environment where everyone else had the trait. As Tom Petty sings "I got my own way of talkin', but everything is done, With a southern accent, where I come from". Our work, both in this paper and in the future, focuses on how to tell the difference between these kinds of behavioural similarities for penguins and people. Robbie Deans has been sacked as the coach of the Wallabies. Deans lost his job because he did not get the outcome that his employers, Australian rugby, sponsors or the Aussie rugby public wanted, namely a series win over the British and Irish Lions (in the first instance) and more wins over New Zealand (in the longer term). Is Deans a bad coach? Maybe he did the best that could be done with the resources available? Whatever, he has paid the price of not producing what was expected (however unrealistic). I was relecting on this culture and how it differs a great deal from being a scientist. As a scientist we do have expectations when we set up experiments and collect samples but we are more than happy to be proved wrong by the data. It would be a grim old world if a scientist had to find what was expected by a funder! Ecology is certainly a field in which we would struggle to deliver a preferred option. Ecology is inherently complex. You are dealing with many species at a landscape level, usually with processes that take a great deal of time. That's not a simple recipe for predictability. One topical ecological issue is the management of tussock grasslands. We know that tussock grasslands have been the scene of a massive invasion by introduced Hieracium weeds for the last few decades. We know that tussock grasslands have been managed in many different ways. We know that localised studies have suggested that there might be major impacts from these factors. However, in ecology we strive to get a handle on the big picture, what's happening over time (decades) and space (hundreds of kilometres). Hannah Buckley, of Lincoln University, along with her MSc student Nicola Day, had access to a long term study in tussock grasslands from around the South Island where they could look at data collected from 124 permanently marked transects from sites throughout Otago and Canterbury that have been measured for 25 years. As part of the overall project they collected the most recent samples and established that weed species of Hieracium have been substantially increasing in the plots over the 25 years. They were interested in what this invasion would do to the tussock grasslands over this period. Sampling was intensive with 50 samples taken along a 100 m transect at each site. The presence of each plant species was recorded and soil samples taken. Site characteristics, like elevation, slope and precipitation were recorded. Crunching the numbers from 25 years worth of research was a large task and was recently published in Austral Ecology. What became very clear was that scale was incredibly important in understanding what has been going on in tussock grasslands. After the first decade it seemed clear that negative changes in plant species composition (what species grew there) and species richness (the total number of species that grew there) had occurred. Nothing too surprising there. However, by the end of 25 years species richness had, in fact, increased again. Their results showed that this fluctuation was not the result of Hieracium invasion (and they speculate that it might have been linked to the severe reduction of rabbit populations at the end of the 1990s due to rabbit haemorrhagic disease) and has important implications for understanding impacts in ecosystems. The first implication is time. Looking in the short term (a few years) may give an imprecise view of what is happening in an ecosystem because short term fluctuations can be mistaken for long term processes. There is evidence from the data that even 25 years is too short for understanding tussock grasslands. The second is space. During the last 25 years there are many sites where there does seem to be a clear relationship between increasing Hieracium and declining plant species richness. However, there are also many sites where there is no relationship and even some where richness has increased. Looking over a wide range of sites is important if the goal is to find a general relationship. This was an unexpected result for Hannah and Nicola, and a reminder as to why we do science. All results carry us forward and provide us with material with which to ask the next set of questions. One of those questions is to explain how this long-term invasion by a weed species has had such a low impact on plant species throughout the range of tussock grasslands. The result does support a theory that many invasive species are 'passengers' rather than 'drivers' of landscape level changes. However, Hannah and Nicola point out, though, that there might be several reasons for lack of an impact from Hieracium. First, tussock grasslands may be reasonably open ecosystems where there are few strong interactions among resident species and Hieracium is just one more species. Second, losses of native plant species may occur only at the local scale where there is competition for space between Hieracium and native plants but not at the larger scale where the major competition is for resources (where sometimes Hieracium is good at getting local resources and sometimes they are not). Third, perhaps there has not been enough time for native plants to fully respond to Hieracium, in much the same way that bush stands can look healthy but are populated by mature trees with no young saplings surviving, such that when the older trees die, there is no replacement and the remnant is lost. Tussock grassland species are perennials and long-lived so this 'extinction debt' is a real possibility. All in all, these findings mean that the next sampling period, a further decade on, will be of much interest to see what clues can be found to help understand tussock grasslands. This uncertainty is a strength of science and is welcomed, something that we have over international rugby coaches! Long distance dispersal is on mind at the moment. This is partly because I am sitting in an airport hotel in Los Angeles after my flight from Salt Lake City was delayed. The delay meant that I could not connect with my long dispersal event over the Pacific back to New Zealand. It's also partly because I just gave a talk on long distance dispersal (LDD) at the evolution conference in Snowbird, Utah. Snowbird is a snow resort during winter which, given it had snowed a week before we got there, is much of the year. It has an elevation of 2400m, so some of the gasps I heard in my talk were probably had nothing to do with what I said. There were marmots on the lawns grazing, coyotes on the road and chipmunks under the picnic tables! Seeing wild mammals is always exciting for New Zealanders. The annual Evolution conferences are great and I though that this year's event was one of the better editions that I had been to. The conference is getting quite large and there were often 8 sessions running at once, meaning a lot of conflict between talks that you wanted to see (hmmm natural selection for audiences?). There were a number of kiwis attending, including my former PhD student Emily Fountain who talked about beetle biogeography around the Canterbury Plains. I was there to talk about the perils of panbiogeography, discuss the different meaning of the 'Gondwanan distribution' and what you miss out on if you take such a strict view on biogeographical hypotheses. You can hear a version of the talk here. In the talk I go through some of the issues with the method of panbiogeography and look at the Chatham Islands (which were the subject of a panbiogeography analysis) and examine what insights you can get from consisdering dispersal scenarios when it comes to understanding the biology of this island group.